There is no shortage of poke chains in California, but most of them seem to coat the fish with a sweet soy sauce dressing. However, the original Hawaiian poke recipe does not use soy sauce at all. The dish originated from native Hawaiian fisherman as a simple way to prepare the day’s catch. They used what they had on hand to season the fish, including sea salt, seaweed, and candlenuts, and ate it raw. Poke is now a worldwide rock star paired with a number of supporting flavors. It is beloved like sushi, except this raw fish is cubed, seasoned, and eaten atop a bowl of salad greens or rice. 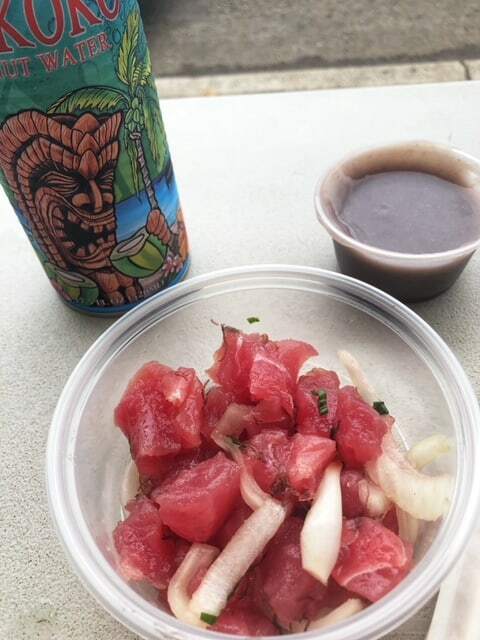 Tuna poke from Pono Market in Kapaa, Kauai. Served with a side of coconut water and poi. 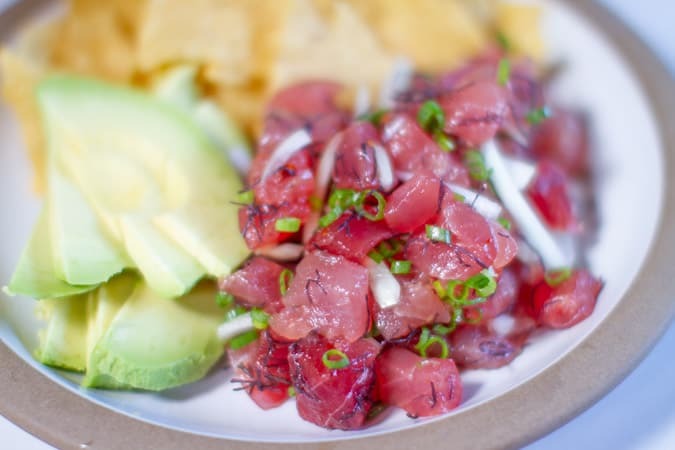 Poke, as pictured above from Pono Market in Kauai, is most commonly bought not at restaurants but at markets in the deli case. It is scooped by the round plastic containers that you pay for by the pound. 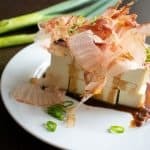 Notice this traditional version, also called Onion Poke, is fairly simple with just a bit of sweet onion, green onion, and faint strips of purple seaweed known as ogo. Rehydrated ogo seaweed. Not to be confused with “limu,” the Hawaiian word for seaweed. Ogo is traditional seaweed used to season Hawaiian poke. Outside of the US, it is a bit harder to find fresh or frozen, so it works wells to purchase it dried and rehydrate in water. When raw, ogo ranges in color from purple to reddish brown. When cooked, it turns dark green. When soaked in alcohol, it turns bright orange. What other ingredient is quite so colorful? Pastry chefs sometimes play with its thickening qualities. 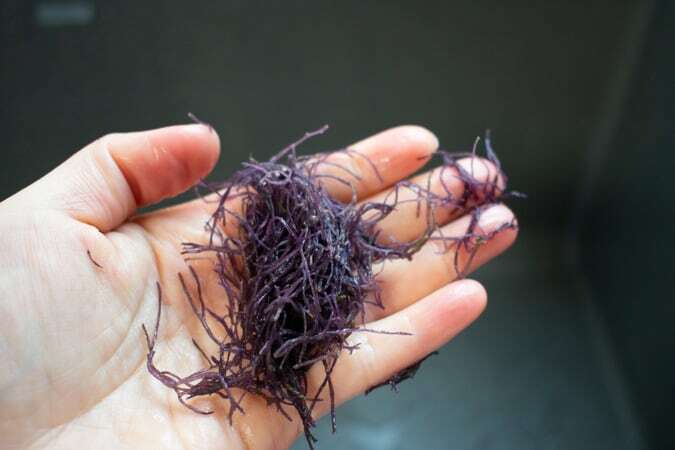 It is one of the seaweeds used to make agar, the vegan thickening powder. (Traditional gelatin is made with pork collagen). Ogo and the seasonings for this recipe can be found in this poke seasoning packet. What kind of tuna should you use? 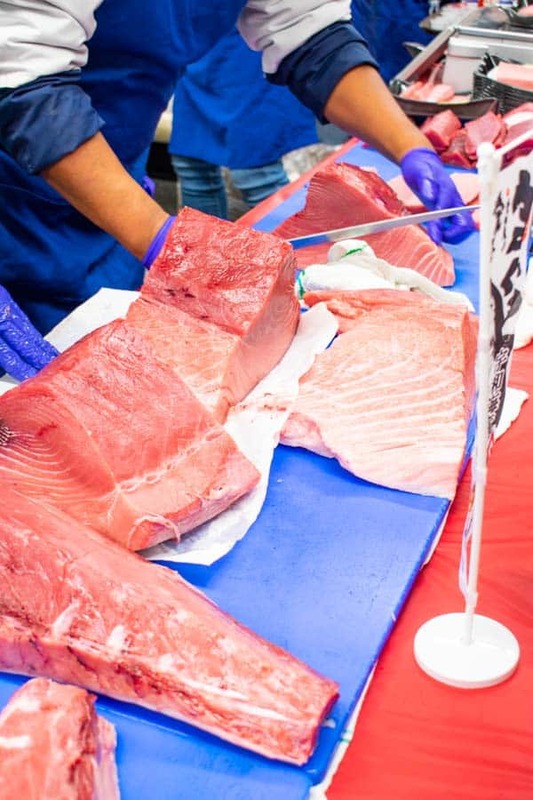 Tuna sold in stores comes in four typical varieties: skipjack, ahi, bluefin, and albacore. 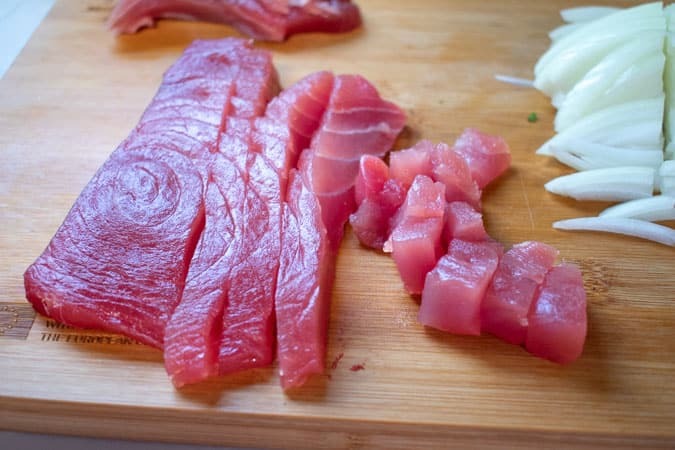 Since this is a raw preparation, you will need to find sashimi grade tuna or other fish that is marked for raw consumption. 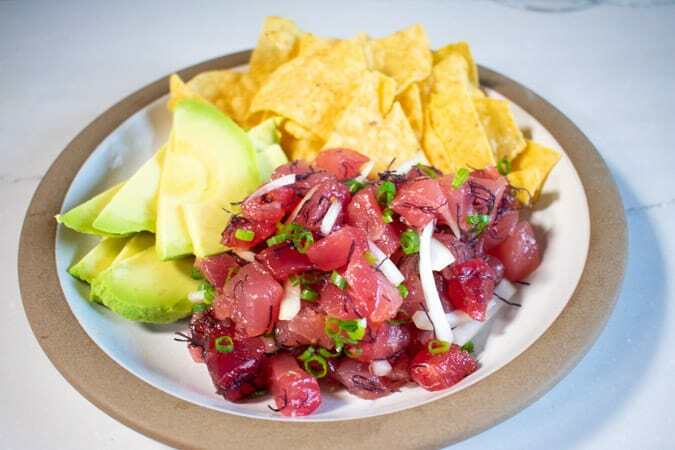 In Hawaii, ahi tuna would typically be used for poke, since it is so readily available off their vast coastlines. This poke recipe, however, can also be made with yellowtail, tako (cooked octopus), cooked clams, and cooked mussels. Salmon is typically prepared with tomatoes in a different recipe called Lomi Lomi Salmon. Pictured above is a wild bluefin tuna caught off the Marshall Islands, sourced from Stuckey’s Sustainable Seafood in Pacifica, CA for $27/lb. Farmed ahi tuna from Japan being cut for sashimi at Nijiya Market in Mountain View, CA. No, it is not cheap, but it also has not been gassed with carbon monoxide. Yes, tuna can be gassed so it stays bright and ferociously pink. Old tuna turns brown quickly, but the carbon monoxide perks it right back up to pink and should be avoided at all cost. Canada, Japan, and the European Union have banned the practice, the FDA has lagged behind regulation. Perhaps the hardest part of this recipe is sourcing quality fish. Take the dried ogo seaweed and cover with water. 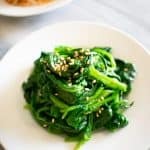 If you can’t find ogo, dried wakame, nori strips, or even pre-made Japanese seaweed salad would work. After at least 5 minutes, you can drain and chop into 1/4″ pieces. 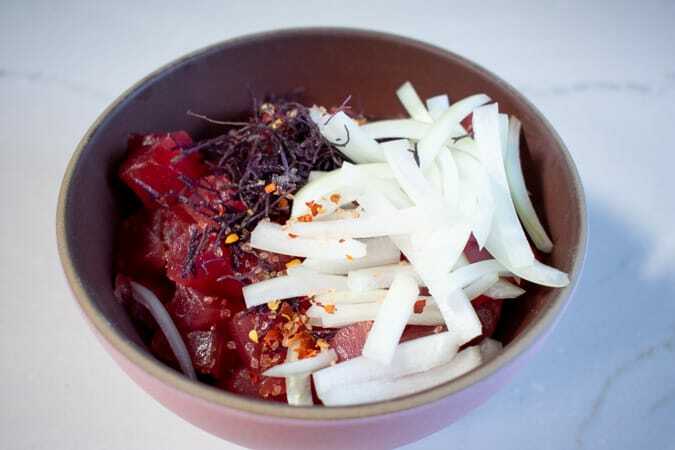 Traditional Hawaiian poke uses sweet Maui onion. Any sweet onion, such as Vidalia or Walla Walla, would work well. If you can’t find sweet onion, rinse a white onion after slicing under water to remove the biting sulfuric acid. Cube the tuna into 1/2″ chunks. 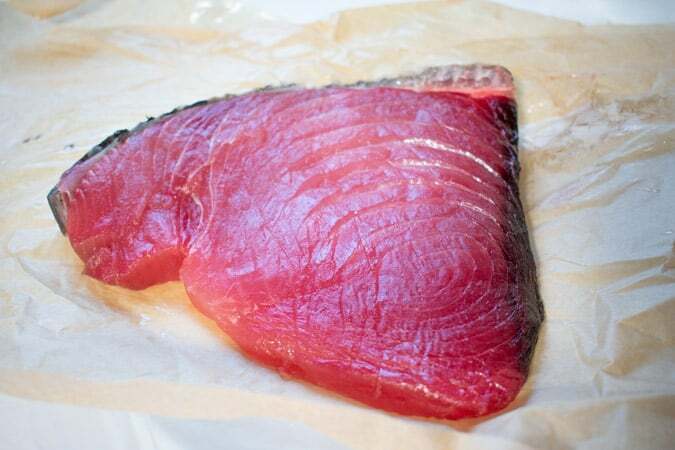 If you are using sashimi grade tuna, there should be little sinew or black bloodlines included. If they are, cut those items away. If you do have some sinew, you can also scrape the tuna off with a spoon and add it to the poke. It does not all have to be in perfectly cut little squares. Mix the tuna, onion, and rehydrated seaweed with sea salt, chopped green onion, sesame oil, and some chili flakes. If you don’t have sesame oil, olive oil works nicely too. This can be done many hours in advance, and the tuna will improve in flavor with the salt curing. However, do eat on the same day. Hawaiian sea salt is reddish/orange in color. Use if you have, otherwise, any other sea salt would be fine. The seasoning packet of dried ogo seaweed, Hawaiian sea salt, and chili can be found in this seasoning packet. No soy sauce needed, and you don’t miss it either. 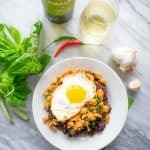 Many wines would work with this recipe, including a mineraly rose or sparkling wine. However, I chose a Pouilly-Fume for its characteristic gun-flint, mineral notes, and dry acidity. 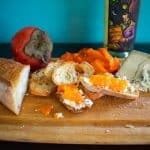 Pronounced pwee-foo-may, it is from Loire region located in northwestern France. The region has been growing grapes since the Medieval Ages until the late 1800s when philloxera and mildew decided to wipe everything out. Sauvginon Blanc grapes were planted with the help of American rootstock. However, the French name their wines after the region, not the grape. The town is Pouilly-sur-Loire. The wine is named Pouilly fume, since fume means smoke in French. The smoke refers to the gray bloom on the grapes at maturity and the smokey, mineral characteristics of the wine. A designated Apellation de origine controllee (AOC) since 1937, it is not to be confused with Pouilly-Fusse, a Chardonnay from Burgundy. (Even though, it is kind of confusing). Sauvignon Blanc grape thrives in this cool climate or Pouilly-sur-Loire, flanked by the Atlantic Ocean and Loire River. It makes fuller and less spicy wine that Sancerre grown in the neighboring town, and it’s soil contains more limestone and flint. 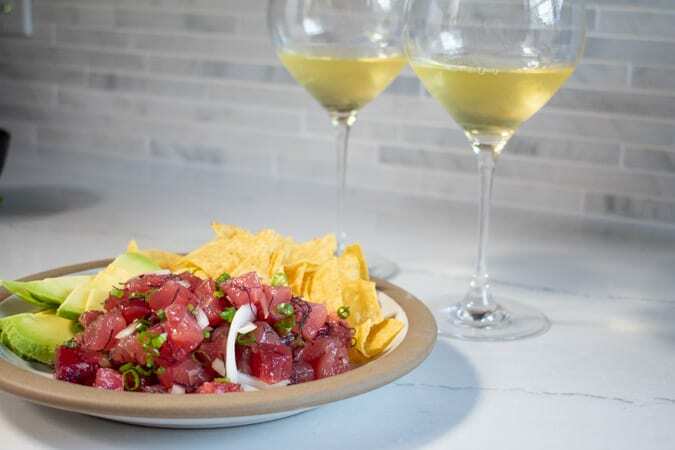 The mineral notes in this wine pair with the seaweed and mineral salt used to season this Hawaiian poke. In addition, the characteristic clean, crisp, citrus acidity do well with not only this dish but with other seafood as well. Try this wine or recipe to get your Hawaiian luau started @ your home. Serve over rice, salad greens, or with chips and sliced avocado as pictured here. Do your best to keep snacking on it before it is time to serve. 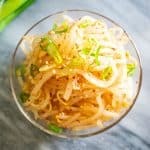 Simple, savory, and no soy sauce necessary. 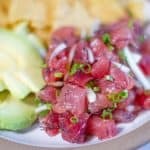 Make this traditional Hawaiian poke with the freshest fish you can find, and let the luau begin. 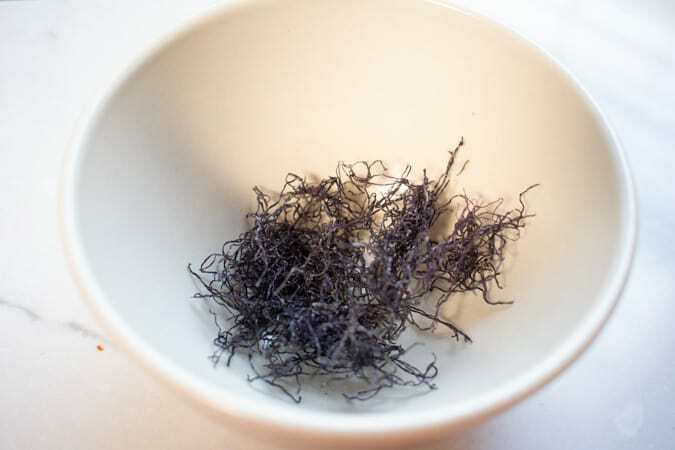 If using dried ogo seaweed, soak in water for about 5 minutes. Drain, squeeze out excess water, and rough chop into 1/4" pieces. Cut tuna into 1/2" dice. Be sure to remove any tough white sinew by using a spoon to scrape off the tuna. Toss cubed tuna with onion, sesame oil, green onion, sea salt and chili flakes if using. Store for up to 6-8 hours before serving. Published on November 24, 2018. Do you love Hawaiian poke? Please spread the Asian ♥ and share!